Hunt Fish Camp Wisconsin "
Info includes size, location, principal wildlife, and habitat. Size: 13,424 acres, all state-owned. Location: 8 miles northeast of Park Falls or take Hwy. 182 east to FR153 north; unlimited undeveloped parking. Principal Wildlife: Ruffed grouse, deer, woodcock, bears, loons, waterfowl, beavers, otters, fishers, coyotes, bobcat, muskrats, ospreys, eagles, timber wolves. Other Recreation: Berry picking, hiking, cross-country skiing. Habitat: Upland forest, conifers, stream, lake, swamp. Size: 960 acres, all state-owned. Location: Access off Hwy. 13. No parking lots. Principal Wildlife: Deer, ruffed grouse, woodcock, snowshoe hares, muskrats, mink, otters, eagles. Other Recreation: Trout fishing, canoeing. Habitat: River bottom, forested upland. Size: 380 acres, all state-owned. Location: 6 miles northeast of Cumberland; town road parking available. Principal Wildlife: Deer, ruffed grouse, waterfowl, beavers, muskrats. Other Recreation: Hiking, berry picking, birdwatching. Size: 2,751.54 acres, all state-owned. Location: 5 1Ú2 miles north of Turtle Lake; town road or small parking areas throughout the property. Principal Wildlife: Waterfowl, deer, ruffed grouse, woodcock, squirrels, furbearers, sandhill cranes, bald eagles. Other Recreation: Birdwatching, hiking, berry picking. Size: 1,176.19 acres, all state-owned. Location: 2 miles north or New Auburn; parking available on north and southeast parts of property. Principal Wildlife: Ducks, deer, pheasants, ruffed grouse, rabbits, woodcock, squirrels, furbearers, sandhill cranes. Yellow River Fishery Area-Size: 708 acres, all state-owned. Location: 5 miles east of Cumberland; parking available on Hwy. 48, on 20th Avenue on south end and on access road off end of 13th St. Principal Wildlife: Ruffed grouse, deer, rabbits, woodcock, furbearers, waterfowl, squirrels. Other Recreation: Trout fishing, hiking, berry picking, birdwatching. Habitat: Stream, marsh, forested upland. Engle Creek Fishery Area-Size: 180.6 acres, all state-owned. Location: 8 miles southeast of Cumberland; parking on northwest part of property. Principal Wildlife: Deer, rabbits, ruffled grouse, furbearers, waterfowl. Other Recreation: Trout fishing, hiking, birdwatching, berry picking. Habitat: Forested upland, swamp, creek bottom. Lightning Creek Wildlife Area-Size: 329 acres, all state-owned. Location: 1 mile northwest of Almena. Sweeney Pond Creek Public Hunting Grounds-Size: 281 acres, (40 owned, 241 leased). Location: 5 miles west of Barron. Principal Wildlife: Waterfowl, furbearers, bald eagles. County "T" Flowage-Size: 287 acres, all state-owned. Location: 2 miles West-northwest of Barron. Principal Wildlife: Mallards, blue winged teal, muskrats, great blue herons, eagles. Quaderer's Creek Public Hunting Grounds-Size: 350 acres, (7 owned, 343 leased). Location: 1 mile southwest of Barron. Size: 600 acres, all state-owned. Location: 4 1/2 miles east of Port Wing. Principal Wildlife: Deer, ruffed grouse, woodcock, snowshoe hares, bears. Habitat: Coniferous swamp, forested upland. Size: 487 acres, all state-owned. Location: 3 miles north of Washburn. Access on Hwy. C.
Principal Wildlife: Deer, waterfowl, snowshoe hares, ruffed grouse, woodcock, eagles, osprey. Other Recreation: Fishing; 13 semi-private campsites and picnic area at Big Rock Ledges. Excellent trout stream with resident brook, brown and rainbow trout as well as anadromous spawning runs of steelhead, brown trout, salmon. Habitat: Stream, slough, Lake Superior. Size: 250 acres, all state-owned. Location: 1 mile west of Ashland. Principal Wildlife: Waterfowl, ruffed grouse, deer, furbearers. Other Recreation: Wildlife observation, canoeing. Size: 2,406 acres, all state-owned. Location: 10 miles north of Drummond. Principal Wildlife: Deer, ruffed grouse, snowshoe hares, bears, otters. Size: 1,469.45 (including lake) acres, all stateowned. Location: 7 miles southwest of Cable; Hwy. 63 to Squaw Bend Road to Sunset Road; small gravel parking area at end of Sunset Road along lake. Principal Wildlife: Waterfowl, deer, ruffed grouse, bears, otters, mink, fishers, beavers, muskrats, coyotes, foxes, osprey, bald eagles, trumpeter swans. Other Recreation: Waterfowl hunting, wild rice harvesting, canoeing, birdwatching, photography (no developed trails). Tiffany Wildlife Area-Size: 12,740 acres, all state-owned. Location: Property on both sides of Chippewa River between Durand and Nelson. Access on Hwys. 25 and 35. Parking lots scattered around perimeter. Principal Wildlife: Waterfowl, deer, squirrels, furbearers, ruffed grouse, turkeys, panfish, walleye, smallmouth bass, channel catfish, northern pike, massasauga rattlesnakes, red- shouldered hawks, blandings turtles, bald eagles, great egrets, crystal darters, river red horse, blue suckers. Other Recreation: Berry picking, canoeing, cross- country skiing, hiking (no marked trails), camping (by permit only), fishing, birdwatching. Habitat: River slough, forest, lake, marsh. Big Swamp Wildlife Area-Size: 760.16 acres, all state-owned. Location: 5 miles west of Mondovi, access on Hwys. A and 10. Principal Wildlife: Pheasants, rabbits, deer, furbearers, sandhill cranes. Whitman Dam Wildlife Area-Size: 2,173 acres, all state-owned. Location: 3 miles southeast of Cochrane and across channel from Merrick State Park. Access from state park, west of Kamrowski Rd. and Corps of Engineer dike at south end of Spring Lake. Principal Wildlife: Waterfowl, furbearers, deer, great blue herons, great egrets, red- shouldered hawks, bald eagles. Other Recreation: Canoeing, fishing, birdwatching. Habitat: River slough, lowland forest, marsh. Namekagon Barrens Wildlife Area-Size: 5,000 acres, all leased. Location: 7 miles east of Hwy. 35 on St. Croix Trail, north and south. Principal Wildlife: Sharp-tailed grouse, deer, bears, coyotes, upland sandpiper, BrewerÕs blackbird. Other Recreation: Birdwatching, photography, prairie plant identification. Habitat: Sand barrens, upland forest. Danbury Wildlife Area-Size: 2,245 acres, all state-owned. Principal Wildlife: Deer, ruffed grouse, woodcock, bear, snowshoe hares. Keizer Lake Wildlife Area-Size: 1,352 acres, all state-owned. Location: 5 miles northeast of Webster on Hwy. A, 4 miles east of Hwy. 35. Principal Wildlife: Waterfowl, grouse, deer, squirrels, woodcock, hares, bald eagles, osprey. Other Recreation: Fishing on Banach Lake (stocked trout) and Big Lake (bluegill, bass, northern pike). Habitat: Water, marsh, forested upland. Goose Lake Wildlife Area-Size: 134 acres, all state-owned. Location: 2 miles east of Fish Lake on Kessler Road in Scott Township. Principal Wildlife: Waterfowl, furbearers, deer, squirrels, ruffed grouse, osprey. Other Recreation: Hiking, cross-country skiing. Habitat: Lake, marsh, forest, uplands. Fish Lake Wildlife Area-Size: 13,197 acres, all state-owned. Location: 3 miles southwest of Grantsburg on Hwy. 87\48. Two observation areas. Principal Wildlife: Waterfowl, deer, furbearers, ruffed grouse, squirrels, eagles, cormorants, sandhill cranes, yellow-headed black birds, trumpeter swans. Other Recreation: Birdwatching, berry picking, hiking. Habitat: Grass marsh, forested upland. Crex Meadows Wildlife Area-Size: 27,467 acres, all state-owned. Location: 1 mile northeast of Grantsburg at Hwys. D and F; rest area and 3 observation areas. Principal Wildlife: Waterfowl, sharp-tailed grouse, deer, bear, furbearers, squirrels, ruffed grouse, sandhill cranes, eagles, osprey, trumpeter swans, loons, peregrine falcons, common and caspian terns. Other Recreation: Berry picking, hiking, cross-country skiing (marked and unmarked trails), picnicking, camping (Sept.-Dec.), birdwatching. Habitat: Grass marsh, prairie, upland forest. Amsterdam Sloughs Wildlife Area-Size: 6,138 acres, all state-owned. Location: 4 miles southwest of Webster along Hwy. D.
Principal Wildlife: Waterfowl, deer, ruffed grouse, furbearers, woodcock, bear, blue heron, osprey. Other Recreation: Birdwatching at Black Brook Flowage. Habitat: Marsh, swamp, forested upland. Sand Creek Fishery Area-Size: 1,326 acres, all state-owned. Location: 10 1Ú2 miles southwest of Bashaw. Principal Wildlife: Deer, ruffed grouse, furbearers. Clam River Fishery Area-Size: 2,151 acres, all state-owned. Location: 5 miles southwest of Bashaw. Principal Wildlife: Deer, ruffed grouse, woodcock, furbearers, eagles, ospreys. Other Recreation: Canoeing, trout fishing (Class I). Tom Lawin Wildlife Area-Size: 4,000 acres, (2,000 owned, 2,000 leased). Location: 2 miles southeast of Jim Falls. Access on Hwys. K and S.
Principal Wildlife: Pheasants, ruffed grouse, rabbits, waterfowl, deer, furbearers, great blue herons, sandhill cranes, shorebirds. Other Recreation: Birdwatching, berry picking, hiking (no marked trails). Habitat: Marsh, farmland, upland, forest. Sportsman's Lake-Size: 1,200 acres, all county-owned. Location: 3Ú4 mile west of Hwy. D on Pine Road. One mile west of Hwy. D on Center Road, then 2 miles south. Principal Wildlife: Ducks, furbearers, Canada geese, deer, bald eagles, sandhill cranes. Other Recreation: Fishing for panfish, bird-watching. Owen Wildlife Area-Size: 135 acres, all state owned. Location: County Hwy. D and State Hwy. 29 just south of Owen. Principal Wildlife: Deer, ruffed grouse, snowshoe hare, woodcock. Habitat: Lowland grass, aspen lowland forest. Dickinson Creek Fishery Area-Size: 80 acres, all state-owned. Location: 11 miles west of Greenwood. Access from Hwy. M.
Principal Wildlife: Deer, ducks, furbearers, rabbits, ruffed grouse, squirrels, herons, sandhill cranes, bald eagles. Habitat: Oak, aspen, northern hardwood forest, stream. Douglas County Wildlife Area-Size: 3,991 acres, (994 owned, 2,997 leased). Location: 3 miles south of Solon Springs on Hwy. 53 or 3 miles north of Gordon on Hwy. 53, west on Hwy. M; roadside parking. Principal Wildlife: Deer, ruffed grouse, waterfowl, beavers, muskrats, foxes, coyotes, sharp-tailed grouse, kestrel, upland sandpiper. Other Recreation: Hiking, birdwatching, berry picking, wild flower observation, picnicking; dog trials by permit. Habitat: Open land, brush, forest. Big Beaver Creek Wildlife Area-Size: 584 acres, all state-owned. Location: 8 miles northeast of Boyceville. Access off of Hwy. F. One parking lot on north side of property. Principal Wildlife: Waterfowl, ruffed grouse, beaver, muskrats, deer. Other Recreation: Berry picking, birdwatching. Property has dams where people can hike. Habitat: Stream, marsh, grassland, forest. Hay Creek Wildlife Area-Size: 375 acres, all state-owned. Location: 15 miles north of Colfax on Hwy. 64. One parking area on south side of property. Principal Wildlife: Ruffed grouse, waterfowl, deer, beaver. Otter Creek Wildlife Area-Size: 402 acres, all state-owned. Location: 6 miles northeast of Wheeler in north central Dunn County. Three parking lots located in various spots around the boundary. Principal Wildlife: Deer, ruffed grouse, waterfowl, beaver, muskrat, otter. Other Recreation: Berry picking, photography, birdwatching, hiking, snowshoeing, developed and mowed walking trails. Lambs Creek Wildlife Area-Size: 711 acres, all state-owned. Location: 4 miles north of Menomonie. One parking area on south side of property. Principal Wildlife: Deer, ruffed grouse, ducks, squirrels, rabbits, beaver, muskrat, turkey. Hay River Wildlife Area-Size: 122 acres, all state-owned. Location: 1 mile east of Wheeler. Access off Hwy. 170. Principal Wildlife: Deer, ruffed grouse, waterfowl, rabbits, furbearers. Gilbert Creek Fishery Area-Size: 120 acres, all state-owned. Location: 7 miles west of Menomonie. Access on Hwy. D.
Muddy Creek Wildlife Area-Size: 4,351 acres, (3,185 owned, 1,166 leased). Location: 2 miles west of Elk Mound. It is 6 miles long and 2.5 miles wide, intersected by Hwys. 12, 29 and I-94. Eight fenced, grassed or gravel parking areas are scattered about its boundaries. Principal Wildlife: Pheasants, rabbits, squirrels, ducks, deer, muskrats, ruffed grouse, woodcock, sandhill cranes, and red-shouldered hawks. Other Recreation: Berry picking, birdwatching. Habitat: Marsh, woodlots, stream, planted prairie grass. Eau Galle River Wildlife Area-Size: 237 acres, all state-owned. Location: 14 miles southwest of Menomonie on Hwy. C.
Principal Wildlife: Waterfowl, ruffed grouse, furbearers, bald eagles, turkeys. Dunnville Wildlife Area-Size: 5,063 acres, (3,673 owned, 1,388 leased). Location: 5 miles south of Downsville. Access on Hwy. Y. Ten fenced, gravel and grass parking areas located throughout wildlife area. Principal Wildlife: Ducks, pheasants, rabbits, grouse, deer, squirrels, furbearers, bald eagles, blandings turtles, red- shouldered hawks, crystal darters, river redhorse, blue suckers, turkeys. Other Recreation: Berry picking, birdwatching, hiking, dog training. Habitat: Marsh, river bottom, farmland, planted prairie grass. Rock Falls Wildlife Area-Size: 271 acres, all state-owned. Location: One mile southwest of Rock Falls. Two developed parking areas on the west and south sides of the property. Principal Wildlife: Pheasants, deer, waterfowl, furbearers, rabbits, squirrels, shorebirds, red shouldered hawks, sandhill cranes. Other Recreation: Hiking, birdwatching, nature study, cross-county skiing. Habitat: Stream bottom, marsh, planted prairie grass. Augusta Wildlife Area-Size: 2,100 acres, (2,028 state-owned and 72 acres easement). Location: 4 miles north of Augusta. Parking areas off Hwy. G and Kelley Road. Principal Wildlife: Ruffed grouse, deer, ducks, rabbits, squirrels, woodcock, bear, turkeys, waterfowl, furbearers, sandhill cranes, hawks, eagles, turkeys. Other Recreation: Hiking (trails not marked), berry picking, cross-country skiing (trails not groomed). Many schools use area for outdoor education. Buffalo River Fishery Area-Size: 1,290.6 acres, (840.15 owned, 450.45 easement). Location: 6-8 miles west and east of Osseo along Buffalo River. Scattered parcels. Principal Wildlife: Ruffed grouse, waterfowl, deer, furbearers, turkeys. Other Recreation: Trout fishing, berry picking, hiking. Habitat: Stream, shrub marsh, upland forest. King Creek Fishery Area-Size: 126.5 acres, (13 owned, 113.5 easement). Location: 4 miles south of Osseo on Hwy. 53. Principal Wildlife: Ruffed grouse, deer, squirrels, furbearers. Northland Lake Fishery Area-Size: 574.50 acres, all state-owned. Location: 2 miles north of Northfield, 2 gravel parking areas. Principal Wildlife: Pheasants, deer, squirrels, turkeys. Other Recreation: Hiking, berry picking. Habitat: Grassland, upland forest, lake. Trempealeau River (North Branch) Fishery Area-Size: 373.6 acres, (262.8 owned, 110.8 easement). Location: 3 miles north of Hixton. Several parking areas. Principal Wildlife: Pheasants, rabbits, squirrels, furbearers, deer, turkeys, waterfowl. Other Recreation: Hiking, berry picking, trout fishing. Habitat: Stream bottomland, upland forest. Stockwell Creek Fishery Area-Size: 797.9 acres, (755.3 owned, 42.6 acres easement). Location: 3 miles northwest of Merrillan. Several improved parking areas. Principal Wildlife: Pheasants, rabbits, grouse, deer, woodcock, furbearers, turkeys. West Taylor Wildlife Area-Size: 98 acres, all state-owned. Location: 1/2 miles southwest of Taylor, 1 parking area (unimproved). Principal Wildlife: Pheasants, ruffed grouse, deer, turkeys. Habitat: Marsh, cropland, upland forest. Trump Lake Fishery Area-Size: 424 acres, all state-owned. Location: 5 miles south of Taylor, 2 gravel parking areas. Principal Wildlife: Deer, ruffed grouse, squirrels, turkeys. Other Recreation: Hiking, berry picking, mushroom hunting. Morgan Marsh Wildlife Area-Size: 192 acres, all state-owned. Location: 14 miles southwest of Black River Falls, 1 parking area (unimproved). Principal Wildlife: Pheasants, rabbits, squirrels, deer, turkeys. Location: 7 miles west of Black River Falls on C, take Soupbone Rd. south 1 mile. Principal Wildlife: Ruffed grouse, deer squirrels, wild turkeys, furbearers. Other Recreation: Birdwatching, berry picking. Lowe Creek Fishery Area-Size: 95 acres, all state-owned. Location: 1 mile south of Hixton, 2 parking areas. Principal Wildlife: Pheasants, rabbits, squirrels, turkeys. Tank Creek Fishery Area-Size: 470.92 acres, all state-owned. Location: 4 miles southeast of Hixton. Several parking areas, gravel or grass. Principal Wildlife: Deer, ducks, furbearers, rabbits, ruffed grouse, squirrels, turkeys. Dike 17-Size: 3,700 acres, all state-owned. Location: 5 miles east of Black River Falls. Access from Hwy. 54. 2 blacktop parking lots. 4 other parking areas unimproved. Principal Wildlife: Geese, ducks, deer, sharp-tailed grouse, turkeys, black bears, bald eagles, sandhill cranes, loons, short-eared owls, yellow-headed blackbirds, bob-o-links, Karner blue butterflies, massasauga rattlesnakes, timber wolves (two packs). Habitat: Marsh, wet prairie, upland, brush. Central Wisconsin Conservation Area -Size: 1,682 acres, federally-owned, state-managed. Location: 23 miles east of Black River Falls. Access from Hwy. 54. Principal Wildlife: Deer, sharp-tailed grouse, turkeys, waterfowl. Location: 3 miles east of Beaches Corners on C, South on Washington Coulee Road 1 mile. Principal Wildlife: Ruffed Grouse, deer, furbearers, turkeys. South Beaver Creek Wildlife Area-Size: 1,216.41 acres, all state-owned. Location: 9 miles west of Melrose, access on Hwy. D. 4 gravel parking lots. Principal Wildlife: Pheasants, ruffed grouse, rabbits, deer, turkeys, squirrels. Other Recreation: Hiking, mushroom hunting, berry picking. Habitat: Marsh, stream, upland forest. North Bend Bottoms Wildlife Area-Size: 1,900 acres, all state-owned. Location: 8 miles southwest of Melrose. Boat landing and parking area (blacktop). Several gravel parking areas. Principal Wildlife: Waterfowl, deer, ruffed grouse, woodcock, furbearers, turkeys. Other Recreation: Hiking, berry picking, canoeing, fishing. Habitat: River, lowland forest, potholes. Sand Creek Fishery Area-Size: 740 acres, (710 owned, 30 acres area fishing only easement). Location: 3 miles south of Melrose, access off Hwy. 71. Principal Wildlife: Deer, furbearers, squirrels, turkeys. Habitat: Stream, upland and lowland forest. Pierce County Islands Wildlife Area-Size: 860 acres, all state-owned. Location: 1 mile west of Bay City on Mississippi River. Located between Hwy. 63 and Bay City. Access by river. Principal Wildlife: Deer, waterfowl, furbearers. Other Recreation: Birdwatching, wildlife observation. 9-Mile Island State Natural Area-Size: 1,374 acres, all state-owned. Location: 1 2 miles northeast of Durand on Hwy 85, 1 2 miles north on Hwy M, access from the Natural Area grounds by boat. Principal Wildlife: Deer, bald eagles, turkeys, hawk and warbler migration, waterfowl, osprey. Other Recreation: Wildlife viewing, hunting, fishing, berry picking. Habitat: River bottom, prairie remnant. -Size: 293 acres, all state-owned. Location: 1 mile west of Durand. 1 designated parking area on north side of property. Principal Wildlife: Deer, ruffed grouse, rabbits, squirrels, furbearers, waterfowl, turkeys. Habitat: River bottom, forest, marsh, planted prairie grass. McKenzie Creek Wildlife Area-Size: 5,497 acres, all state-owned. Location: 1Ú2 mile south of Clam Falls. Parking lots on north, south, and central part of property and at McKenzie Lake. Town road parking throughout. Principal Wildlife: Deer, woodcock, waterfowl, ruffed grouse, squirrels, furbearers, bald eagles, osprey. Other Recreation: Hiking, berry picking, birdwatching, fishing (trout stream fishing and warm water lake fishing). Habitat: Stream, lake, forested upland. Rice Beds Creek Wildlife Area-Size: 3,101 acres, all state-owned. Location: 7 miles northwest of Turtle Lake. Parking on Hwy. G and west side of property. Principal Wildlife: Deer, ruffed grouse, woodcock, waterfowl, squirrels, furbearers. Other Recreation: Hiking, birdwatching, berry picking, fishing. Loon Lake Wildlife Area-Size: 2,751.54 acres, all state-owned. Behning Creek Fishery Area-Size: 171 acres, all state-owned. Location: 4 miles southeast of St. Croix Falls. Principal Wildlife: Pheasants, deer, grouse, waterfowl, rabbits, furbearers. Other Recreation: Trout fishing, birdwatching. Balsam Branch Wildlife Area-Size: 180 acres, all state-owned. Location: 8 miles northwest of Amery. Parking lots on north and south end. Habitat: Stream, potholes, brush, marsh. Joel Marsh Wildlife Area-Size: 1,072 acres, all state-owned. Location: 4 miles west of Turtle Lake, parking area on north end of property. Town road parking on the south and west. Principal Wildlife: Waterfowl, furbearers, deer, squirrels, sandhill cranes, bald eagles. Other Recreation: Fishing, birdwatching, hiking. Habitat: Marsh, brush, grass, woodlots. 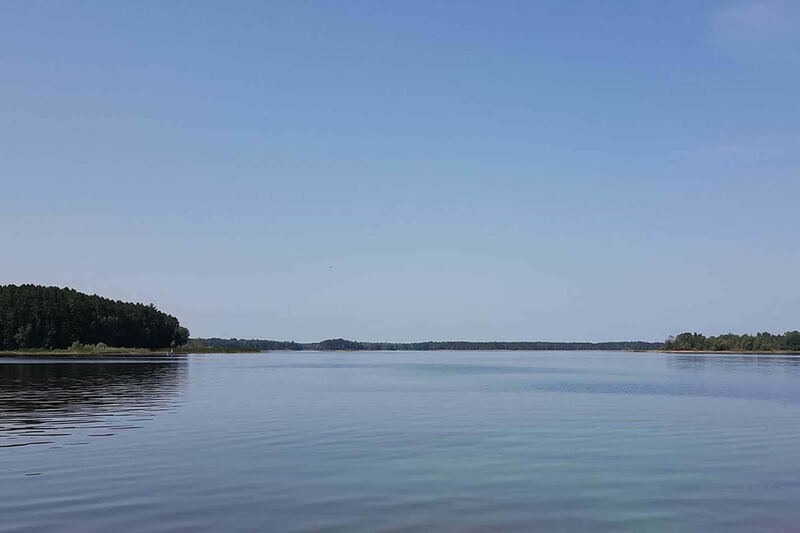 Wagon Landing Springs Fishery Area-Size: 66.5 acres, all state-owned. Location: 4 miles northeast of Star Prairie; parking on town road. Principal Wildlife: Deer, rabbits, ruffed grouse, furbearers. Other Recreation: Trout fishing, birdwatching, berry picking. Habitat: Forested upland, brush, grassland, creek bottom. Parker Creek Fishery Area-Size: 219 acres, all state-owned. Location: 5 1Ú2 miles southwest of Amery. Principal Wildlife: Waterfowl, pheasants, furbearers. Snake Creek Fishery Area-Size: 200 acres, all state-owned. Location: 3 miles west of Clear Lake and 3 miles south of Amery. Principal Wildlife: Deer, grouse, waterfowl, furbearers, rabbits, squirrels. Ten Mile Creek Wildlife Area-Size: 213 acres, all state-owned. Location: 7 miles east of Chetek. Access on Hwy. D.
Principal Wildlife: Waterfowl, woodcock, ruffed grouse, furbearers, eagles. Potato Creek Wildlife Area-Size: 984 acres, all state-owned. Location: 7 miles south of Weyerhauser. Access off Hwy. D and F.
Principal Wildlife: Waterfowl, woodcock, ruffed grouse, deer, furbearers, eagles, osprey. Habitat: Marsh, forested upland, flowages. Washington Creek Wildlife Area-Size: 516 acres, all state-owned. Location: 11 1Ú2 miles south of Bruce. Access on Hwy. E.
Principal Wildlife: Waterfowl, deer, rabbits, woodcock, ruffed grouse, sandhill cranes. Totagatic Wildlife Area-Size: 2,719 acres, all state-owned. Location: 7 miles northwest of Hayward on Hwy. 27; ample parking along roads and at numerous pull-off areas. Principal Wildlife: Waterfowl, furbearers, deer, ruffed grouse, woodcock, bears, fishers, eagles, osprey, black terns, osprey, otter, fox, coyotes. Other Recreation: Flowage supports a very good fishery, especially largemouth bass; boat landings are located at east and west ends of the flowage. Overlook for wildlife viewing adjacent to Hwy 27 below the Nelson Lake dam. Hiking, birdwatching, berry picking, wildflower observation. Habitat: Flowage, forested upland, openings. Flat Creek Wildlife Area-Size: 373 acres, all state-owned. Location: 6 miles southwest of Hayward. Principal Wildlife: Deer, ruffed grouse, woodcock, snowshoe hares. Habitat: Swamp, marsh, forested upland. Kissick Swamp Wildlife Area-Size: 941 acres, all state-owned. Location: 2 miles west of Hayward on County Hill Road (one small parking lot at south entrance off County Hill Road and another at north entrance off Chippanazie Road). Principal Wildlife: Deer, ruffed grouse, snowshoe hares, woodcock. Other Recreation: Minimum maintenance area with very little use other than hunting and trapping. Chief River Wildlife Area-Size: 1,183 acres, all state-owned. Location: 12 miles east of Hayward on Hwy. B; parking on road edges and small pull-off areas. Principal Wildlife: Deer, ruffed grouse, snowshoe hares, fishers, coyotes. Habitat: Coniferous swamp, forested upland, stream. Weirgor Springs Wildlife Area-Size: 2,160 acres, all state-owned. Location: 15 miles northwest of Ladysmith and 2 miles north of Weirgor on Polish Road. Principal Wildlife: Deer, ruffed grouse, woodcock, rabbits, beavers, otters, muskrats, raccoons, eagles. Other Recreation: Hunting, fishing, trapping, nature observation, cross-country skiing (trails not marked or groomed). Habitat: Springs, stream, marsh, forested upland. Silvernail Wildlife Area-Size: 1,044 acres, all state-owned. Location: 16 miles northeast of Ladysmith. Principal Wildlife: Deer, bears, ruffed grouse, woodcock, snowshoe hares, raptors. St. Croix County Islands Wildlife Area-Size: 1,106 acres, all state-owned. Location: 3 miles northwest of Somerset. Parking and canoe launch off Rice Lake Rd. best access from river. Principal Wildlife: Waterfowl, deer, furbearers, eagles. Cylon Marsh Wildlife Area-Size: 513 acres, all leased. Location: 4 miles northeast of Deer Park. Roadside parking. Principal Wildlife: Waterfowl, furbearers, woodcock. Cylon Wildlife Area-Size: 2,345 acres, all state-owned. Location: 1 mile east of Deer Park. Parking lots (gravel) located at end of 210th Ave., end of 230th St. and West side of 240th St. Roadside parking also. Principal Wildlife: Grouse, squirrels, ducks, pheasants, deer, furbearers. Habitat: Marsh, farmland, woodland, wetlands. Borst Valley Wildlife Area-Size: 994 acres, all state-owned. Location: 7 miles northwest of Independence at intersection of Hwys. V and VV. Principal Wildlife: Ruffed grouse, squirrels, deer, rabbits, turkeys, furbearers. Other Recreation: Berry and mushroom picking, cross- country skiing (no marked trails), trout fishing. Chimney Rock Wildlife Area-Size: 614 acres, all state-owned. Location: 9 miles north of Independence. Access along Hwy. Y, 2 miles west of Hwy. 93. Principal Wildlife: Rabbits, deer, squirrels, turkeys, ruffed grouse. Other Recreation: Cross-country skiing (no marked trails), berry picking, mushroom picking. Tollefson Marsh Wildlife Area-Size: 120 acres, all state-owned. Location: Four miles south of Osseo on east side of Hwy. 53. Principal Wildlife: Ruffed grouse, deer, squirrels, rabbits. Other Recreation: Hiking, birdwatching, berry picking. Lakes Coulee Wildlife Area-Size: 589 acres, all state-owned. Location: 2 miles southwest of Blair along Elias Rd., east of St. Hwy. 95. Principal Wildlife: Ruffed grouse, squirrels, deer, rabbits, furbearers, turkeys. Other Recreation: Berry and nut picking, mushroom picking. Vosse Coulee Wildlife Area-Size: 123 acres, all state-owned. Location: 4 miles northeast of Blair and 2 miles north of Hwy. 95 on Hwy. W.
Principal Wildlife: Ruffed grouse, deer, furbearers, rabbits, turkeys. Tamarack Creek Wildlife Area-Size: 542 acres, all state-owned. Location: 10 miles north of Trempealeau on west side of Hwy. 93. Access on Hwy. F.
Principal Wildlife: Turkeys, rabbits, squirrels, deer, ruffed grouse, great blue herons. Other Recreation: Trout fishing, berry picking. Trempealeau Lakes Fishery Area-Size: 164 acres, all state-owned. Location: 1 mile southeast of Trempealeau. Access from Hwy. 35. Principal Wildlife: Rabbits, furbearers, waterfowl, ruffed grouse, great blue herons, turtles, red-shouldered hawks, bald eagles, great egrets. Other Recreation: Fishing, canoeing, pier for disabled fishing. Habitat: Lakes, marsh, forest, prairie. Whalen Creek Fishery Area-Size: 188 acres, all state-owned. Location: 4 miles north of Trego. Principal Wildlife: Deer, ruffed grouse. Other Recreation: Trout fishing, trapping, hiking, berry picking. Habitat: Stream, marsh, springs, forested upland. Bean Brook Fishery Area-Size: 1,351 acres, all state-owned. Principal Wildlife: Deer, ruffed grouse, snowshoe hares, woodcock, furbearers. Sawyer Creek Fishery Area-Size: 744 acres, all state-owned. Location: 3 miles southwest of Spooner. Principal Wildlife: Ruffed grouse, deer, woodcock, squirrels, hares, cottontails, furbearers, ospreys. Other Recreation: Trout fishing, hiking, cross- country skiing on trails. Habitat: Stream, springs, marsh, forested upland. Beaver Brook Wildlife Area-Size: 1,323 acres, all state-owned. Location: 1 1Ú2 miles southeast of Spooner. Principal Wildlife: Deer, ruffed grouse, woodcock, waterfowl, furbearers, eagles, osprey. Other Recreation: Hiking and skiing (15 miles of gated trails), trout fishing. Bear Lake Fishery Area-Size: 262 acres, all state-owned. Location: 9 miles north of Rice Lake. Principal Wildlife: Waterfowl, furbearers, deer, grouse, woodcock, sandhill cranes, eagles, osprey. Other Recreation: Birdwatching, gathering wild rice (along Boyer Creek).